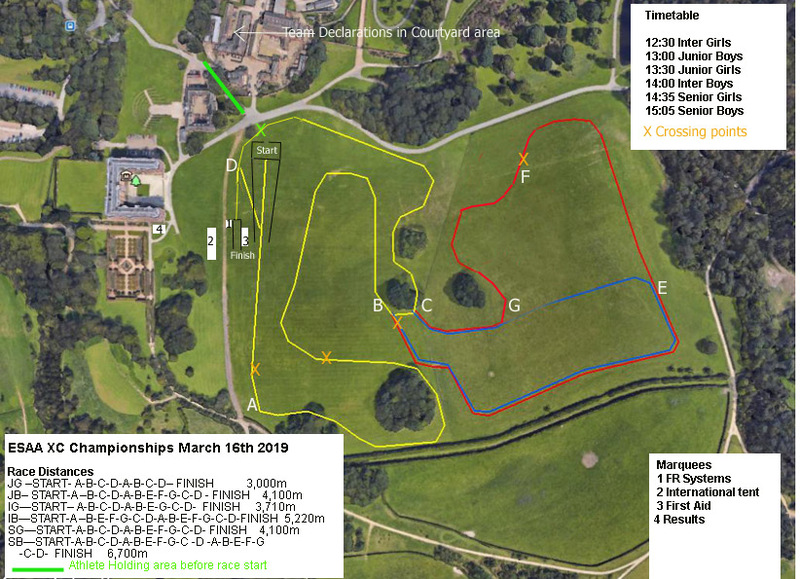 The 59th Boys and 51st Girls New Balance English Schools' Cross Country Championship is to take place at Temple Newsam Park on Saturday 16th March 2019. Note that this is the same location as used in 2018. The park is situated South East of Leeds and is just a few minutes from Junction 46 on the M1. Temple Newsam is one of the great historic estates in England. Set within over 1500 acres of parkland, woodland and farmland landscaped by Capability Brown in the 18th century, it is a magnificent Tudor&hyphen;Jacobean mansion. Famous as the birthplace of Lord Darnley and home to the Ingram family for over 300 years, the mansion houses rich collections of works of art. The garden is renowned for its Rhododendron and Azalea walk and features the National Plant Collections of Delphinium, Phlox and Aster novi&hyphen;belgii. Europe's largest working Rare Breeds Farm, with over 400 animals, is set within the original estate Home Farm. We are extremely grateful to Leeds City Council for allowing us to use this wonderful setting. You can view the park's extensive interactive website here. Google Earth: simply search for Temple Newsam. enter postcode LS15 0AE as the destination (that is ZERO AE, not oh AE). Travel directions are shown on the right here. Note that the route a Satnav will display will be closed. You MUST follow the instructions given here. Reserved parking space will allocated as close to the finish as possible. You need to reserve your space before the event. Blue badge holders who wish to apply for a car park pass should email Paul Allison (allison.pa@nottinghamhigh.co.uk) Please provide your car registration number and email address and a pass with be emailed. Take the M1 to juntion 46, turn westwards onto the A6120 ring road towards Leeds. After approx 300m stay in the middle lanes and go straight on at the roundabout, towards Leeds. Take the 2nd exit onto Selby Road. The final approach to Temple Newsam has two routes, this is the way a Satnav will show but the road will be closed - you need to follow the further instructions below. After about 600m you arrive at traffic lights, with a small easy to miss signpost to Temple Newsam House on the left hand side just before the lights. DO NOT TURN LEFT HERE - the road will be closed. Continue straight on through the lights for approximately 1600m, passing through a multitude of light-controlled pedestrian crossings and eventually arriving at a fairly congested shopping area. Continue through up to a large LIDL store on the left. Immediately after the entrance to the LIDL car park, turn very sharp left at the traffic lights onto Temple Newsam Road. Temple Newsam Park is about 1600m down this road. There will be signs and stewards directing you to car parks. There will be 4 parking areas designated for public parking, team coaches, and VIP/officials/BlueBadges. 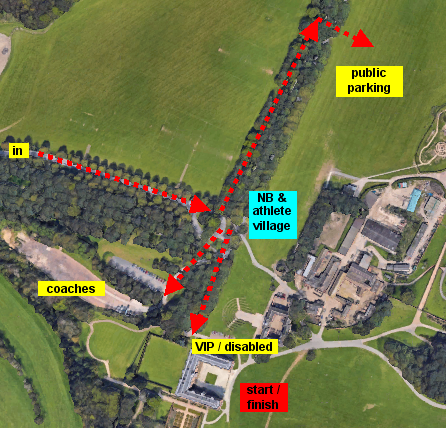 Coaches will be parked in a dry hard-standing area adjacent to Temple Newsam House, and will remain there for the duration of the Championships. Public parking will be on grassland to the north as shown on the site map above. There will be a parking charge of £8 per car, which will include an event programme. Please ensure that you have the correct money available to help speed entry to the parking area. As with any Cross Country, the courses may be subject to change due to wet weather and/or snow. We will update the current state here during the week before the Championships. If the weather is too wet, the parking arrangements may be modified. Updates will be displayed here during the week before the Championships. It is quite likely that athletes will get muddy. Coach drivers really don't appreciate their shiny new coaches getting mucky, so please ensure that you bring enough plastic bags to safely wrap up your muddy kit before you try to get back on your team coach. It is envisaged that the Team Race presentations will take place during the afternoons races. There will be announcements made to keep you aware of the times of the Team Race presentations. Competitors should assemble in the marquee behind the start area in plenty of time before their race. Competitors will be allowed into the start area 5 minutes before the beginning of each race. A warning will be given 3 minutes before each race. At this time, competitors should assemble behind their start pen. With 1 minute to go competitors will be instructed to move into their start pen and line up in race order by the Start Stewards. Competitors should listen carefully to any last moment instructions given by the Starter. The start will be by gun. Numbers must be securely pinned on the front of the County vest. Any mutilation or folding of these numbers may lead to disqualification. Counties can enter up to 12 athletes in each age group, but only 8 are allowed to run in the event. Names are published here but these are not necessarily in selection preference order and your name appearing in these lists DOES NOT MEAN YOU WILL GET TO RUN IN THE CHAMPIONSHIPS. Whilst every effort is made to ensure that names are spelled correctly, mistakes do sometimes occur. Competitors are asked to check these lists so that their name appears correctly in the programme and in the results. Everything to do with the event is prepared automatically from these lists so if your name is wrong here, it will be wrong everywhere! Please ask your friends/colleagues/pupils to check the spellings of their names. Changes notified to us by noon on Sunday 3rd March will appear in the programme and in the results. Any errors notified after that time will appear correctly in the results, but will be too late to be included in the programme. The team lists shown here won't be regularly updated with spelling changes - we need to split out the entry lists to go to the various printers and processors and it is too time-consuming to re-edit all the files here as well as those we use to go to print. This is an extremely busy time for us, however, spelling changes will be made in the files we use for printed material and results production. If you find any spelling errors, please notify us immediately giving your County, Age Group, and the correct spelling. Please don't keep re-sending emails requesting spelling changes, one email is enough. Because of the high volume of mail we receive at this time of year we don't have time to reply to them. All ESAA competitions are subject to the strict anti-doping policies of British Athletics and IAAF. Further information can be found on the ESAA anti-doping page. Athletes are advised that Health & Safety regulations recommend that you should examine the course for potential hazards before competing. The course will be checked by the organisers and a risk assessment conducted. A final inspection will be made on the morning of the event and any issues arising will be addressed then. The course is on mixed-use land which may be grazed by farm animals. As a matter of normal daily life, we advise that athletes and spectators check that they are up to date with anti-tetanus injections - don't forget that you need a booster jab every 10 years. Any competitor who has concerns about a safety aspect on the course should bring it to the attention of the organisers immediately. If the issue cannot be resolved satisfactorily, the competitor will be advised not to participate in the event. Photographs of ESAA events might be published in the athletics press, local media, and on this website. All ESAA photographs are taken in accordance with the guidelines relating to photos in schools published by the Information Commissioner with regard to the General Data Protection Regulations 2018. Click the guide to the GDPR button in the menu on the left to find a brief summary of the new regulations as they apply to sporting events. Photographs and videos can be taken by the public from public areas for personal use only. They may not be published in any form (including on personal or club websites) without written permission from the ESAA. Most ESAA competitions are held on private land and are therefore deemed to be 'not public' areas. All ESAA events are SCHOOL events and are therefore covered by regulations governing what can and can't be done in schools. One important point therefore is that you are not allowed to take photographs of school activities for commercial publication without specific written permission from event organisers. This is no different to the fact that one cannot simply walk onto a school playing field and start taking and publishing photos - most parents, and the Information Commissioner, would strongly agree that school activities should not be published unless publication is under strict control. Photographers at ESAA events wishing to publish photos in the media or in any other form (eg. internet websites), or wishing to use them for anything other than personal use must be officially registered and accredited by the ESAA, and register the use to which photos will be put, and to obtain permission for that use. Permission WILL be retrospectively withdrawn if anyone is found to be in breach of the uses which they registered with us, and under such circumstances, the offender will be required to delete all images they hold from our events. This therefore precludes operators who simply turn up, make videos, then publish them with associated advertising which is outside of our control. No one has permission to do this unless they have written consent from the ESAA. We are aware that some people register themselves as press photographers then publish complete videos of our events online, and even make their broadcasts available for sale. This is very specifically not allowed. In effect, they are broadcasting companies making television programmes without our permission. It doesn't matter how they publish their content, whether by television over the air or via the internet, or via DVD. The fact they broadcast our event content to the world makes them broadcasters. To be an accreditted broadcaster for the ESAA, they need to be properly established companies, properly registered and regulated by the broadcasting authorities, and they need to be properly registered with the Information Commissioner. Also, in order to sell their content they need to have been given written permission to sell what is our copyright, and pay the necessary royalties due to us. They also need to comply with the UK Distance Selling Regulations in order to take payments from the public. There is also the very important fact that under the rules of UK athletics, televised athletics events in the UK need to be authorised by the UK Governing Body. The ESAA operates under these rules. A list of officially accredited photographers will be published on this website shortly after the event along with their contact details. It is not possible to prevent photographs of any particular individual from appearing in the media. If this is a problem for you, you are advised not to take part in the event. If any parent wishes a particular picture of their child appearing on this website to be removed please contact us and we will do our best to resolve any problem.